About the year 1864, there came to Dakshineswar a wandering Vaishnava monk, Jatadhari, whose Ideal Deity was Rama. 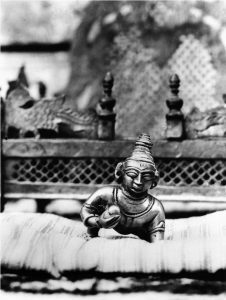 He always carried with him a small metal image of the Deity, which he called by the endearing name of Ramlala, the Boy Rama. Toward this little image he displayed the tender affection of Kausalya for her divine Son, Rama. As a result of lifelong spiritual practice he had actually found in the metal image the presence of his Ideal. Ramlala was no longer for him a metal image, but the living God. He devoted himself to nursing Rama, feeding Rama, playing with Rama, taking Rama for a walk, and bathing Rama. And he found that the image responded to his love.